I am now pleased to offer Tampa Changing note cards. The note cards are 5″x7″ and printed on high quality card stock. Each package contains ten folded cards and envelopes. 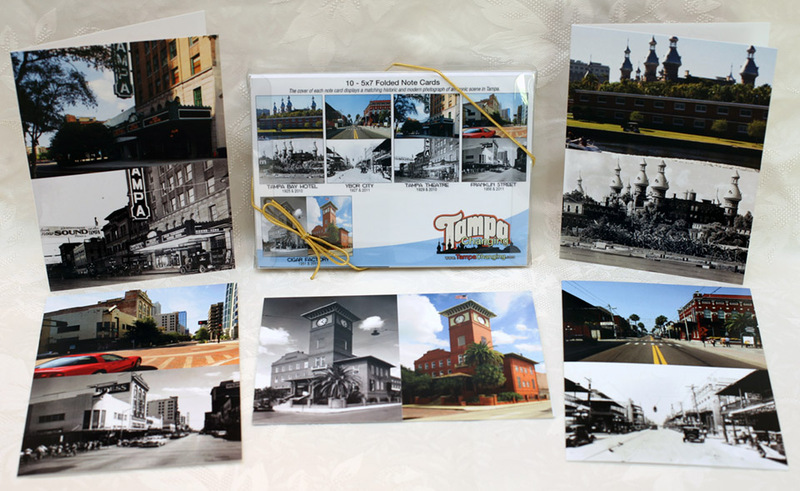 The packages are made up of two sets of five iconic Tampa landmarks: Tampa Theatre, The Tampa Bay Hotel, Franklin Street, 7th Avenue, and the J.C. Newman Cigar Factory. The insides of the note cards are blank. On the back of each note card is a short description of the matching historic and modern scene pictured on the front. Don’t forget, these note cards make excellent gifts for the upcoming holiday season. Each box of note cards contains two sets of five different historic & modern images plus envelopes. Great service to all us native Floridians (Tampa born/bred). Thank you for your time and effort. Hopefully we can save many more historic sites not only in Tampa but around the State before it’s all gone!